Aqua Sushi + Juice Bar was a last minute dinner decision one night because Six suddenly had to go away for work for 4 weeks, so we only had time for a 30 minute dinner before he had to leave. In this case, take-out was the way to go. 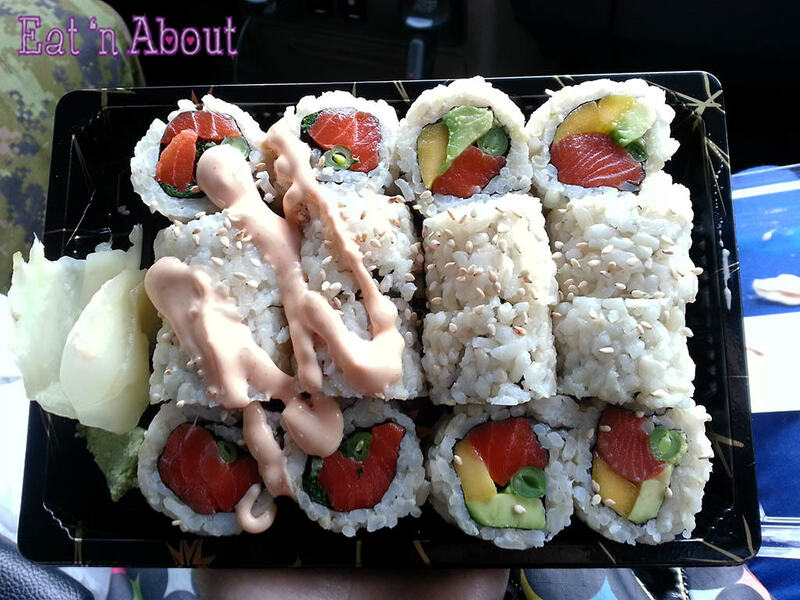 Aqua Sushi + Juice Bar makes all their sushi with nutritionally superior brown rice instead of white rice. 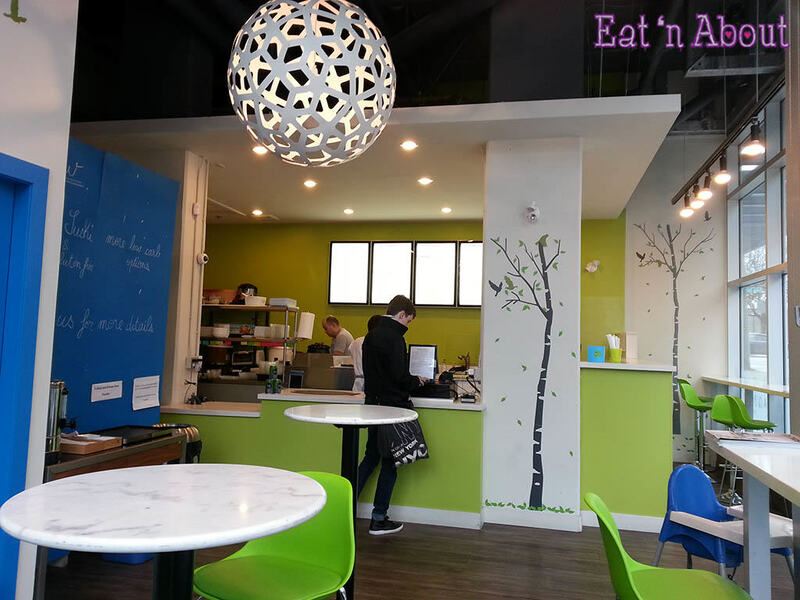 In fact, when Six was looking at the menu, he commented “Oh….this is one of those healthy places…” Not sure if he was disappointed or not, but it was a funny comment. Oh, and as the name says, they’re also a juice bar. We didn’t get any though, so that’s all I got to say about that. I found Aqua’s prices to be quite reasonable, despite being “one of those healthy places“. Their most expensive sushi roll was $9. THey also have quinoa sushi cones, low carb no-rice rolls, vegetarian picks, as well as sashimi and some starters. We ended up getting three rolls. Actually I had two and he had one. Six picked the Spicy Wild Salmon Roll ($5, left) and it’s made with kale and green bean. 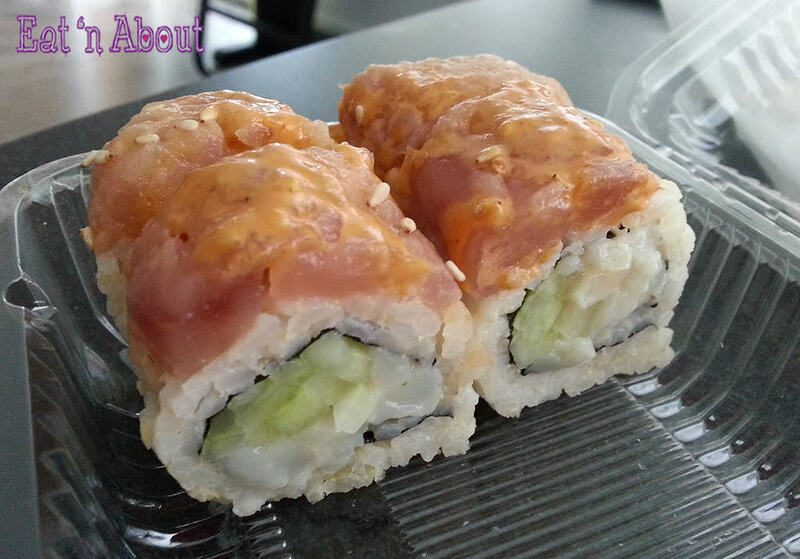 The first of my rolls was the Aqua Roll ($5.50, right) made with wild salmon, avocado, mango, green bean. Not too sure if I’m fond of the green bean in either rolls. It does impart a fresh crunch, but the sushi as a whole was quite bland. I think the rice could’ve been seasoned a bit more with vinegar. The mango from the Aqua Roll did give a good sweetness to the roll but that’s about it. My second choice was the Red Roof Roll ($7.50). This was a chopped scallop roll topped with spicy tuna and unagi dressing. Because of the spicy tuna and the unagi dressing, this was a bit more flavorful, but still quite bland compared to the usual sushi I’m used to. I also am partial to chewier rice, and with the brown rice, it just went a bit mushy. Overall I wasn’t impressed. Next PostIt’s Possible! We can bring Trader Joe’s Thai “Dry” Chili Paste back! !